On February 15, medical journal Lancet issued a historic retraction. It took back a paper that drew a link between vaccines and autism and helped fuel a backlash against immunization of children. In 1998 a Lancet paper reported dozen kids developed various behavioral problems. Eight of them had been vaccinated with a combination shot against measles, mumps and rubella (mmr). 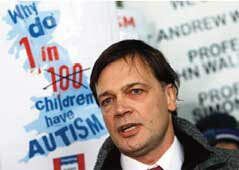 Andrew Wakefield, the lead investigator, said the vaccines were to blame for the children’s illness. But it later emerged that he had been taking money from a lawyer suing vaccine makers. Most of Wakefield’s co-authors retracted the paper’s interpretation. Lancet too backed away from the paper in 2004, but defended its publication on grounds it helped “raise new ideas”. In its February 15 retraction, the Lancet editors wrote that it’s clear parts of the paper are “incorrect”. According to the bbc, the last straw for the medical journal was a ruling by UK’s Medical Council that Wakefield had acted dishonestly. Richard Horton, Lancet’s editor in chief, defended the journal’s handling of the controversy. “We’ve always said there was no link between the vaccine and the behavioral problems. ” But he acknowledged Wakefield had conducted “a one-man campaign” against the vaccine.